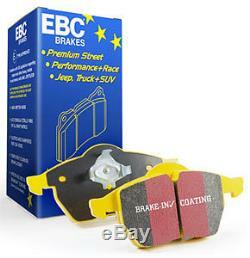 EBC YELLOWSTUFF BRAKE PADS FRONT DP41574R TO FIT FOCUS ST MK2. Ford Focus ST Mk2 2.5 Turbo 2005 - 2011. 1 x Set Front Brake Pads. Yellowstuff Fastest Street, Trackday & Drift racing brake pads. High friction formula improves brake effect 30-40%. Fastest brake pads for Street, Drift & Trackday racing. Zero brake fade makes this material perfect for fastest driving. Capable of repeated heavy brake use without brake Fall-Off. Very minimal disc/rotor damage characteristics. Suitable for shorter track events and race use. Medium hardness material feels good at pedal. If all you need is stopping power, this is the material choice. ECE R 90 type approved for most cars. Features red brake in surface coating for instant safe braking after install. EBC Yellowstuff 1793 compound is a true winner all round, it has high friction from cold, not requiring warm up for street use yet when loaded up and really hot the brakes just get better. Even up to truck weights these pads grip and do not heat fade. They also suitable and the most fastest brake pads for Trackday & Drift racing. EBC yellows are ECE Brake safety tested which means they must work perfectly from cold at least as good or better than stock pads. When Yellowstuff see some heat (which is not tested for in the ECE R 90 brake safety regulations) they really show their pedigree. On Japanese cars built with lower friction FF rated pads these deliver a full grade higher stopping and on German cars built with GG these are about the only aftermarket pads that will match or beat the pretty good German OE spec pads and that takes some doing. EBC medium dust fast street pad with 20-25% % brake improvement. Superb material for lighter model Asian and European sport compacts. We specialise in the best brands and products available in our sector and bring them to you at very competitive prices. Barnett, Bilstein, Castrol, Dynojet, EBC, Eibach, Galfer, K&N and many more top brands. By sourcing products direct from the manufacturers we can bring excellent service and savings against high street prices. With a fast, friendly, informed staff, we strive for 100% satisfaction and aim to be the best at what we do. We are always expanding our range of top brands so be sure to sign up to our newsletter for our latest products and deals. We aim to process and dispatch your orders placed Monday - Friday; on the same or next day. We ask that you return the item in the same condition you received it in, and in the original packaging. We pride ourselves on a quality service and we are happy to address any concerns. The item "EBC YELLOWSTUFF BRAKE PADS FRONT DP41574R TO FIT FOCUS ST MK2" is in sale since Wednesday, August 12, 2015. 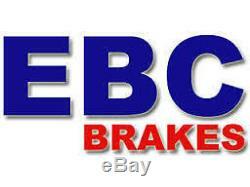 This item is in the category "Vehicle Parts & Accessories\Car Parts\Brakes & Brake Parts\Brake Pads". 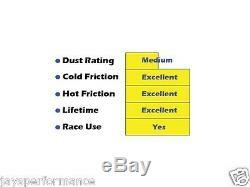 The seller is "jaysperformance" and is located in Fife. This item can be shipped worldwide.